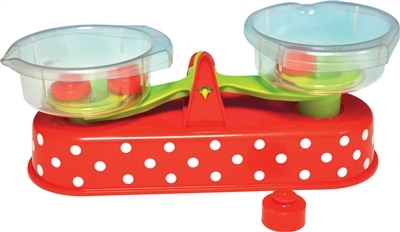 Gowi Toys 7 piece balance scale and weights kitchen toy for learning about weights and measures in early childhood. Functional scale body is approx. 12" x 4" x 5" high, 2 measuring cups with spout are 4.5" diameter. Set includes 4 weights. For ages 18m+, can be used in preschool or kindergarden learning environments.